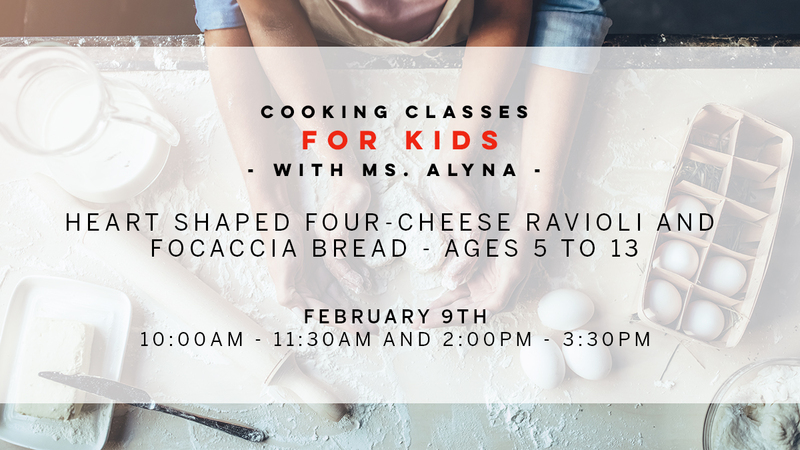 Join us for the February edition of Kids in the Kitchen with Ms. Alyna and an unforgettable hands-on experience for your child. Learn how to prepare heart shaped four cheese ravioli and focaccia bread from scratch. Mix, stir, measure and pour while building your cooking skills and vocabulary. Afterwards enjoy your delicious creations! In each class, kids get to try their hand at making seasonal recipes while learning basic culinary techniques such as mixing and measuring. Ages 5-13, parent participation is encouraged but not necessary. Please arrive 5 minutes early to ensure class starts on time. RSVP for 10am class here. RSVP for 2pm class here.